I am dying to remodel our kitchen. At first look, it really isn’t bad. It has granite counter tops in a nice color (very similar to those pictured below). It has stainless steel appliances and white cabinets. It has tile floors and yellow walls. But, really, it is not so great. 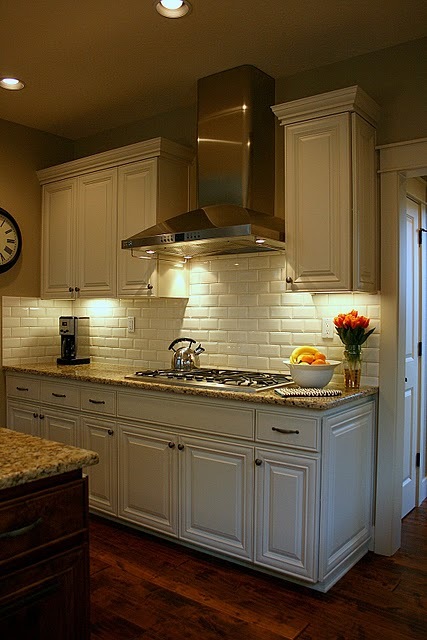 I just LOVE the subway tile back splash in this kitchen. We don’t have a back splash. These cabinets are white, but new and clean. Ours are original to our 1947 house. That is OLD. They have been painted, but dirt cakes on them and is not easily wiped clean. I like the look of white cabinets, but want them in a material that doesn’t attract dirt like a magnet. I love how this one is counter top height with bar stools as the desk chairs. 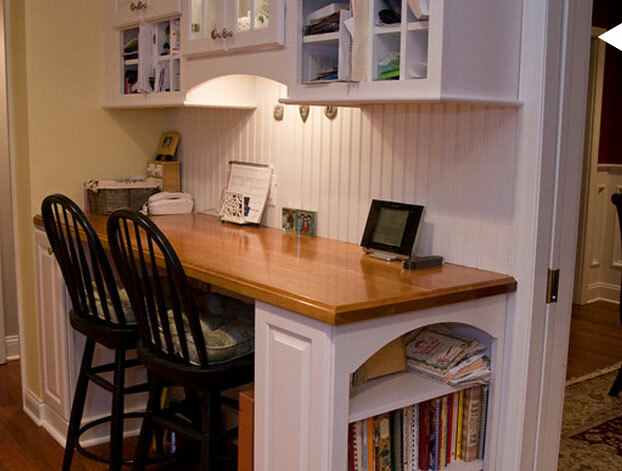 This allows for more food prep or serving space while also functioning as a workspace. I also LOVE the bookcase on the side for cookbooks. The kitchen floor is probably my biggest complaint. I really hate our floors. They are really terrible. First, the color is too light, so every time the dogs track mud in through the doggie door (which is in the kitchen), the floors look like we haven’t cleaned them in years. Another thing that adds to the constantly dirty look is that the sealant is just missing in most areas. I can see the parts where it has worn off for whatever reason. The grout looks as though it was painted white because it chips off in chunks revealing black nastiness underneath. I clean them at least once a week, sometimes two or three times if we have company, but they ALWAYS look gross. 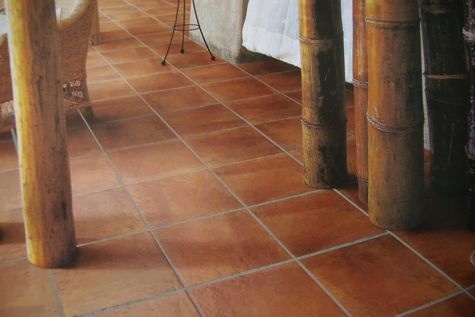 These are similar to the tiles in my in-law’s home. They have some extra and we might beg them for some to at least redo the kitchen floors, if we can’t afford a whole remodel. 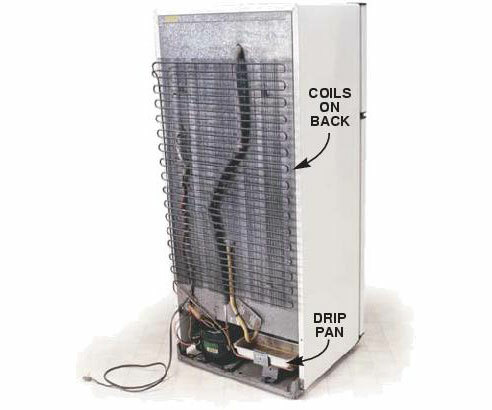 Another problem is that our laundry area is in the kitchen. There are folding doors that keep it out of sight, but I would love to push out the wall and have an enclosed laundry room with storage. 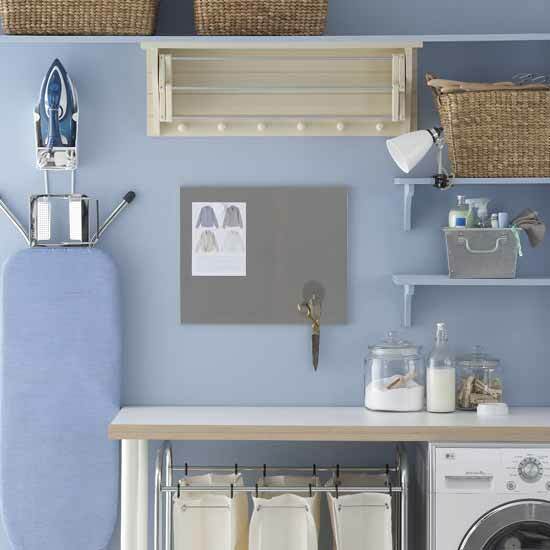 Isn’t this blue laundry space adorable? This would also give us another wall to work with in the kitchen so instead of an L shape, we would have a U, allowing much more room for cabinet and counter space. This next part makes me sad. There is no real place for a refrigerator in our kitchen. We have it in front of a window. I’d like to have that window and use it, or close it off so people looking in don’t see the back of our fridge. What a pathetic sight. Yuck. One day, we will remodel our kitchen. I’m not sure when, but I know it will happen. Not only will it make us more happy with our home (which I really do love, by the way), but it will most definitely increase its value. ← What are you, Teddy? Have you ever considered refacing your kitchen cabinets? 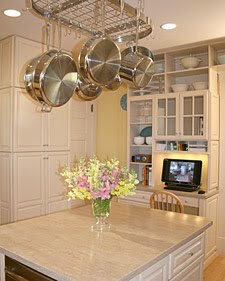 If you're decently satisfied with the lay-out, it would be a much less expensive option than completely rebuilding a kitchen. When you two get more serious about this, let me know because this is the type of work Corey has done for the past 10 years. He'd definitely be able to offer some suggestions. We definitely want to redo the layout as well, but thanks for the tip! Beautiful. For now I'm living in a studio with a tiny apartment, but I look forward to getting a fixer-upper someday. I have dreams of gleaming white cabinets, hickory hardwood floors, a farmhouse sink, white subway tile and kelly green accents (including a bright green pegboard for pots and pans).